Harper Beckham celebrates her birthday in princess dress at Buckingham Palace with Princess Beatrice: Pics! Celebrity royalty! Harper Beckham celebrated her sixth birthday in an epic fashion on Monday. The daughter of Victoria and David Beckham visited Buckingham Palace with a group of friends where she not only dressed up like a princess but spent the day with Princess Beatrice. 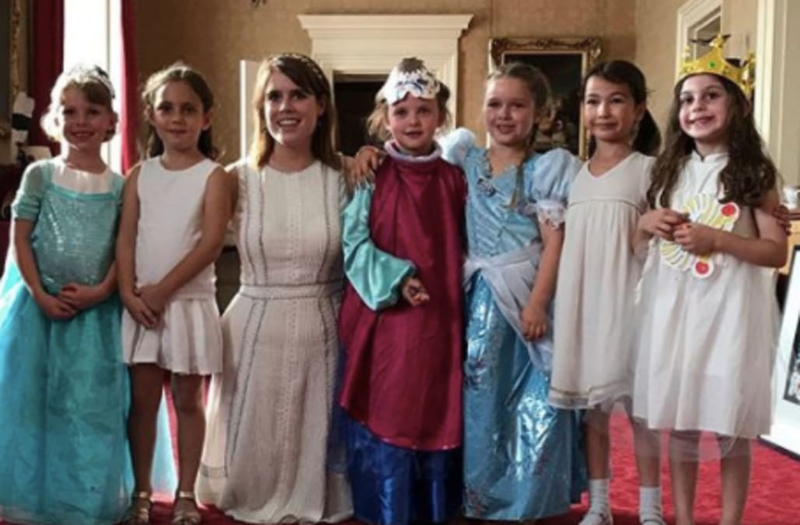 "Lucky Harper meeting a real life princess at the Palace x," David captioned a group shot of Harper in her Cinderella gown with a group of pals and Beatrice. MORE: Nicole Kidman, Milo Ventimiglia, and More Sing Spice Girls' 'Wannabe,' Victoria Beckham Reacts: Watch! Harper also posed with her dad outside of the palace, which he captioned, "Happy Birthday to our special little young lady ...Such a special girl who brings so much joy and happiness into our lives.. Happy 6th birthday ( I can't believe your 6 already ) have the most amazing day we love you pretty lady x @brooklynbeckham @romeobeckham@cruzbeckham @victoriabeckham." The little one's fashion designer mom also shared a shot of her in her princess costume holding a red balloon. "Our little birthday princess x Kisses," Victoria wrote. Prior to her princess extravaganza, Harper was also treated to a family party. Victoria shared a group shot without the birthday girl, writing, "Family day to celebrate Harper's birthday x We love u all so much x kisses." Harper's older brothers all celebrated her special day with sweet Instagram tributes. "Happy birthday to my little sister. Love you so much," Brooklyn captioned a pic with his sis. Romeo posed with Harper in another photo, writing, "Happy birthday to the best sister in the world!!!!!!! I hope you have an amazing day . I love you so much." MORE: Victoria and David Beckham Celebrate 18th Anniversary With Epic Throwbacks-- See the Pics! And Cruz shared a photo of himself lifting Harper on his shoulders, writing, "Dear Harper I can't believe it has been already 6 years yoyo are such a big girl so to the best sister in the world I love you so much have an amazing day."